Thank you Flatout Flatbread for sponsoring this post of Greek Chicken Gyro Flatbread Pizzas. All opinions are my own. 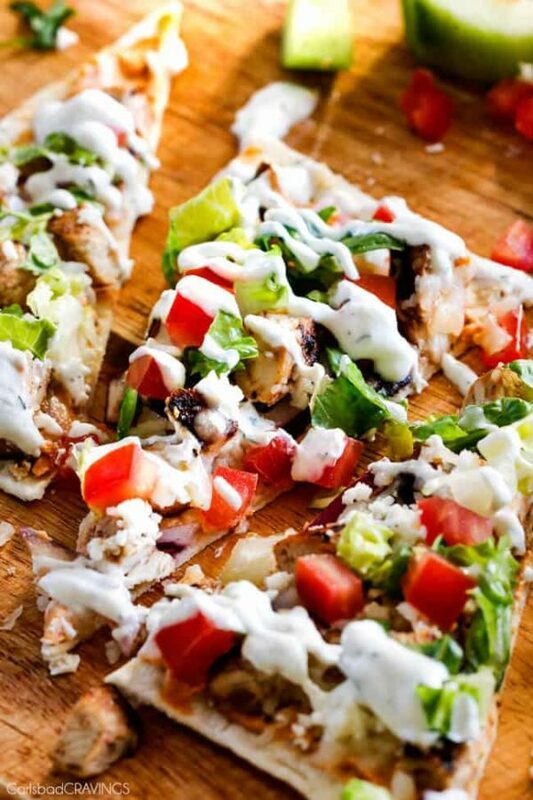 These quick and easy Chicken Gyro Flatbread Pizzas layered with sun-dried tomato basil hummus, flavor bursting Greek Chicken, red onions, mozzarella and feta all drizzled with easy Blender Tzatziki make the most satisfying lunches/dinners or a super fun appetizer! 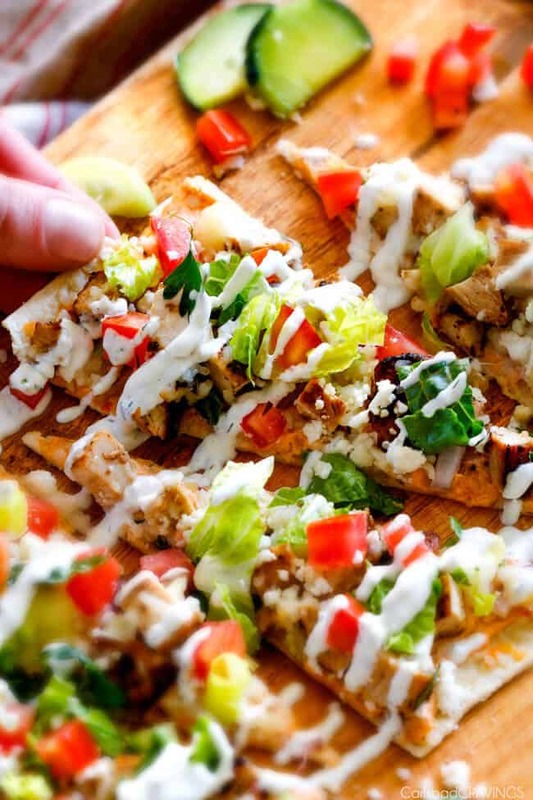 You guys, these Greek Chicken Gyro Flatbread Pizzas are one of my favorite culinary creations! And the Greek Chicken marinade might be my new favorite chicken marinade e-ver. It’s definitely Patrick’s. 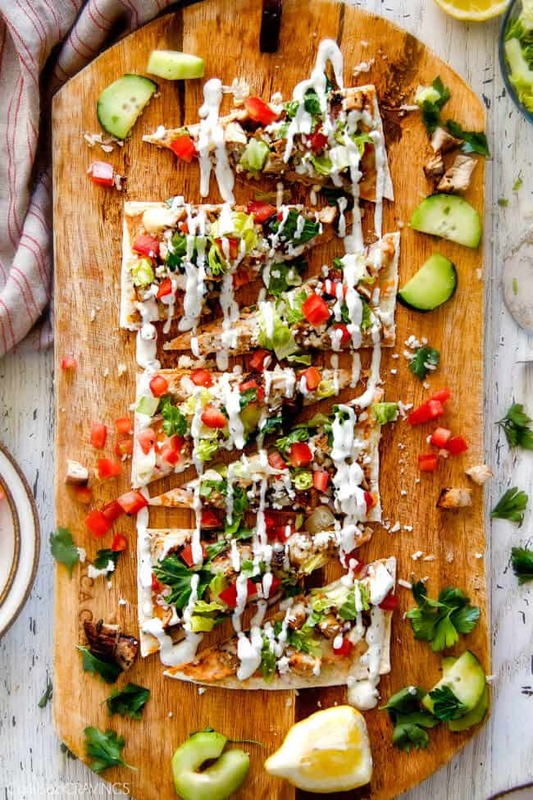 This is actually a huge surprise to me as I am more of an Asian and Mexican food kind of girl, but there is no denying the deliciousness that is this Greek Chicken Gyro Flatbread Pizza. The flavor deliciousness starts with the marinade for the Greek Chicken. A Greek Chicken Gyro is only as good as the chicken – and this one is a 10 out of 10 in my opinion. The marinade has quite a few ingredients but they are mostly a quick dash of common pantry spices that when combined make this chicken so good you will be want to eat it just plain! To make the marinade, whisk together olive oil, balsamic vinegar, lemon juice, and a plethora of spices including garlic, oregano, cumin, basil, and paprika. Best. chicken. EVER! When it comes time to actually make your Greek Chicken Gyro Flatbread Pizzas, they take minutes to whip up because you have already marinated your chicken. First you bake your Flatout Flatbreads for 2 minutes. Flatout Flatbreads come in Rosemary and Olive Oil, Spicy Italian, or Rustic White. I used Rustic White because that’s what I had on hand but I can’t wait to try these flatbreads with the other two flavors! And because we are using flatbreads instead of pizza crust, you can eat and eat and eat with a big blissful, guilt free smile on your face. The wonderfully thin, perfect amount of crispy Flatout Flatbreads, get layered with store bought (AKA easy), sun-dried tomato basil humus mixed with sour cream, followed by your Greek chicken and red onions, mozzarella and feta cheeses. Bake for 4 minutes (yes, that quick and easy!) then top with lettuce, tomatoes and Blender Tzatziki Sauce. 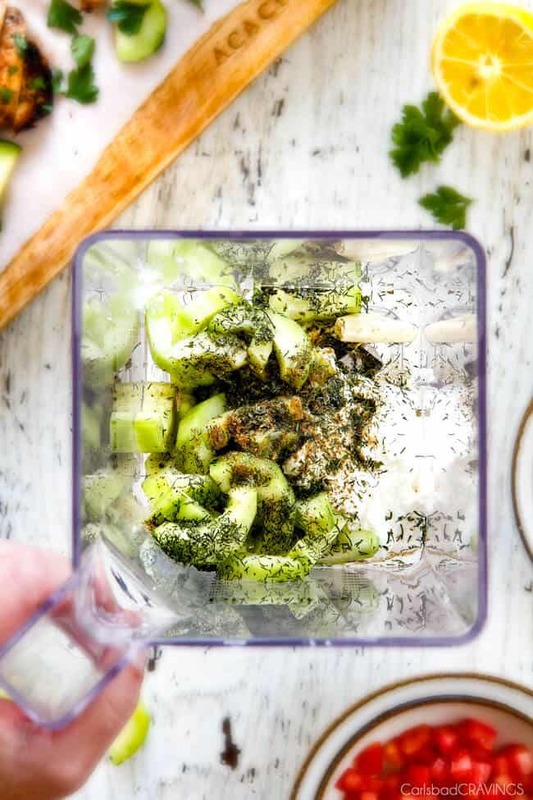 I like to make my Blender Tzatziki Sauce the same time I am marinating my chicken, that way it is extra chilled, the flavors melded, and requires no extra time or effort when it comes to making the Greek Chicken Gyro Flatbread Pizzas. This Tzatziki Sauce is extra simple because there is no need to strain your cucumbers because we want the sauce to be a little thinner than usual – more the consistency of a dressing than a sauce – so we can easily drizzle its creamy tang all over our Flatbread Pizzas. I’ve subbed out half of the Greek Yogurt for sour cream because I personally like the taste way better but feel free to use all Greek yogurt if you prefer – or even all sour cream if you prefer. The thin crunch of the Flatout Flatbread, the creaminess of the sour cream Sun-Dried Tomato Basil Hummus, the juicy, flavor exploding chicken, the cheesy gooey mozzarella, the tangy feta and creamy punch of dill infused Blender Tzatziki Sauce makes this Greek Chicken Gyro Flatbread Pizzas one fresh, satisfying and irresistible meal you won’t be able to live without! Looking for more Greek recipes? 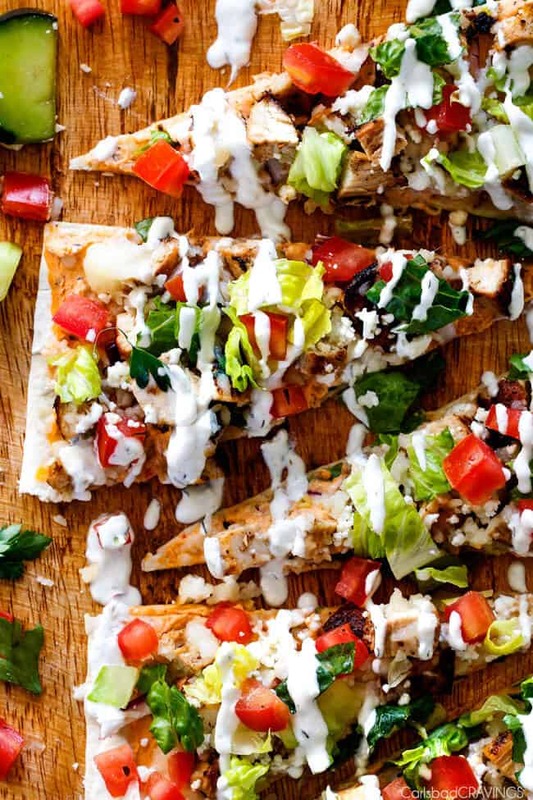 Want to try these Greek Chicken Gyro Flatbread Pizzas? Pin it to your PIZZA, DINNER, or CHICKEN Board to SAVE for later! Greek Marinade: Whisk together all of the Greek Marinade ingredients in a large freezer bag and add chicken. Marinate 4 hours up to overnight. Chicken: When ready to make Flatbread Pizzas, remove chicken from fridge and let sit at room temperature 20-30 minutes (you can prep your toppings during this time). Heat one tablespoon olive oil in a large non-stick skillet over medium high heat. Once very hot, drain chicken from marinade, pat dry and add to skillet. Cook undisturbed for 3-4 minutes, or until nicely browned on one side. Turn chicken over, cover, and reduce heat to medium. Cook for approximately 5-7 more minutes (depending on thickness of chicken), or until chicken is cooked through. Remove to cutting board and let rest 5 minutes before chopping into bite size pieces. Bake and Assemble: Meanwhile, heat oven to 375 degrees F. Place 2 Flatout Flatbreads on a cookie sheet and bake for 2 minutes. Remove from oven. Whisk together 1/3 cup hummus and 2 tablespoons sour cream. Divide evenly between two flatbreads and spread in an even layer. Top hummus layer with red onion, chicken, mozzarella cheese and feta. Bake for 4 minutes or until mozzarella has melted (feta will not melt). Garnish pizzas with desired toppings such as tomatoes and lettuce (and bacon would be delish too!). Drizzle with Tzatziki Sauce. Serve immediately. Hi Jen! I love using flatbreads for pizza because I prefer a thin crispy crust because you don’t get filled up on the bread. And, like you said, with flatbreads only having 100 calories you can eat and eat without any guilt! These toppings are so delicious, I can’t wait to make this for dinner! Hi Dorothy, I am excited for you to make these for dinner too! The flatbread is perfect with this recipe and you are so right – you can eat more without the guilt because of them! I hope you have an absolutely fantastic weeK! I could have some form of pizza three times a day. What could be better than a protein on delicious bread plus a tasty sauce and cheese? YUM!! Will have to make this on our pizza night. I love that you have pizza night – such a fun tradition! 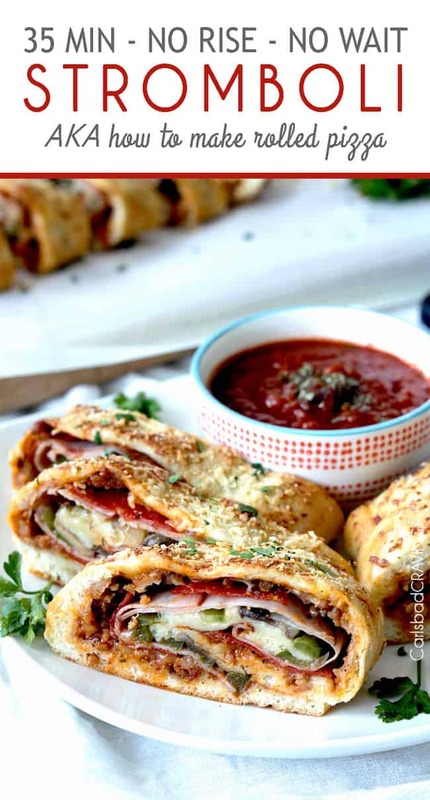 This would definitely be a fun pizza to mix things up and I think everyone would love it! Thanks Marisa! Hope you and your family are well! Well ok, this was delicious! Definitely one I’ll be making often. Thank you! You are so welcome Layne! so happy it is a repeat! Thanks! I’ve never heard of Italian Flat Out Bread -where do you buy this from? These were really delicious. 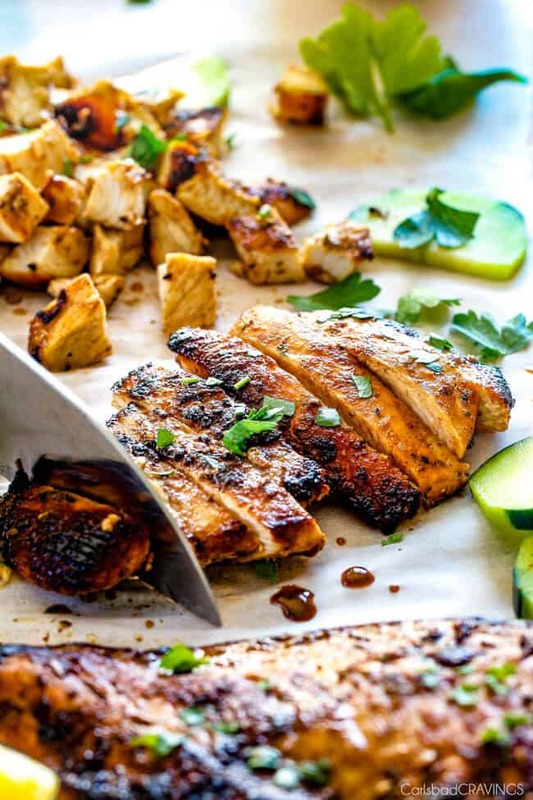 The chicken marinade is just incredible, and will become a go-to marinade that I’ll use almost any time I’m looking to grill chicken. It was so good! Awesome Sarah, I’m so happy you loved this recipe especially the chicken! It’s one of my favs too 🙂 Thanks for taking the time to comment!